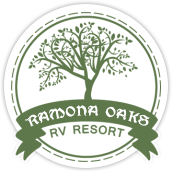 Take highway 78 east through Ramona and continue 5 miles to the entrance to Ramona Oaks RV Resort which will be on the left. The entrance can be easy to miss so as you approach 5 miles keep an eye out on the left side. Drive north on highway 67 and continue through Ramona. Highway 67 will become 78. Continue 5 miles to the entrance to Ramona Oaks RV Resort which will be on the left. The entrance can be easy to miss so as you approach 5 miles keep an eye out on the left side. From exit 18, Poway road, drive east on Poway road to highway 67 and turn left. Drive north and highway 67 will become 78. Continue 5 miles to the entrance to Ramona Oaks RV Park resort which will be on the left. The entrance can be easy to miss so as you approach 5 miles keep an eye out on the left side.